They say we have to hear something seven times for it to really sink in. Decorators know you need to repeat an accent colour three times in a room for it to register in the mind as THE accent colour. In my years of decorating show homes in seasonal themes, I found repetition gave the most impact. 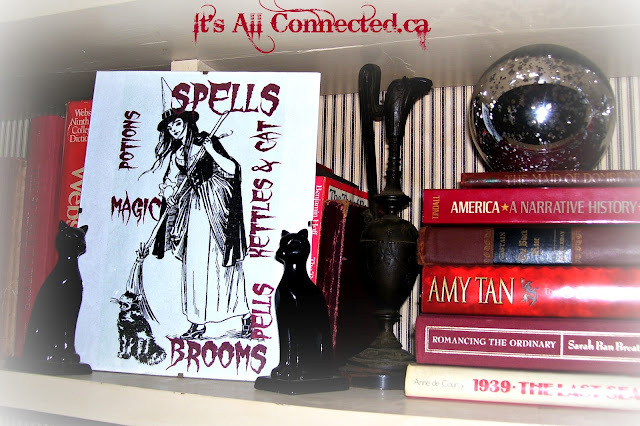 When I decorated the little 28" long mantel in my library for Hallowe'en, I stuck with the witches and crows theme that was on the bookcases. They are identical but setting them at different angles makes them seem different. They're big enough to catch the eye. I feel it has more presence that having a crow, a pumpkin and a ghost. I tend to lean toward using uneven numbers in this kind of grouping, as well. 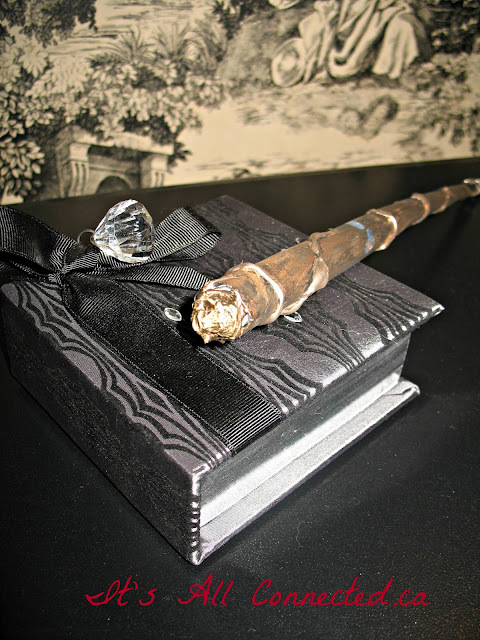 To see how I made the wand click here. I guess this is my sneaky way of having clutter that doesn't quite look like clutter. If I say it seven times, you'll believe me! I'm a believer too! I love those crows, they look great all lined up! That little victorian frame is one I couldn't have passed up either. Now I'm off to see that paper wand. Missed it last year...since I wasn't a blogger then. I love the black and white design. I am totally in love with your toile wallpaper! I love the black and white combo. 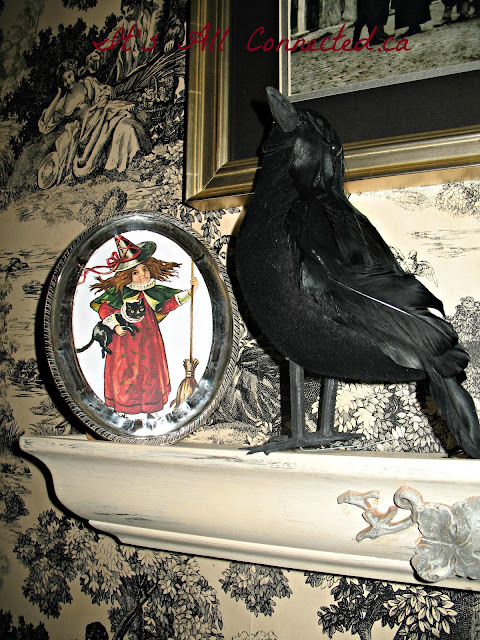 I love the shelf the crows are on and that little witch picture too. It's just for a few days! Heck...get some more! The crows look really good together...power in numbers. 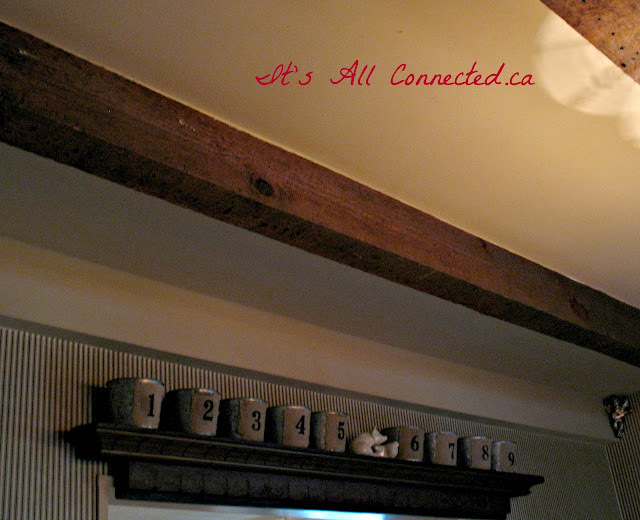 I love what you did with the little tins, burlap, and numbers. I'm going to be watching for some of those! Yes, it is definitely true that the human eye differentiates the odd number grouping from other things. I guess the uneven factor has something to do with it. 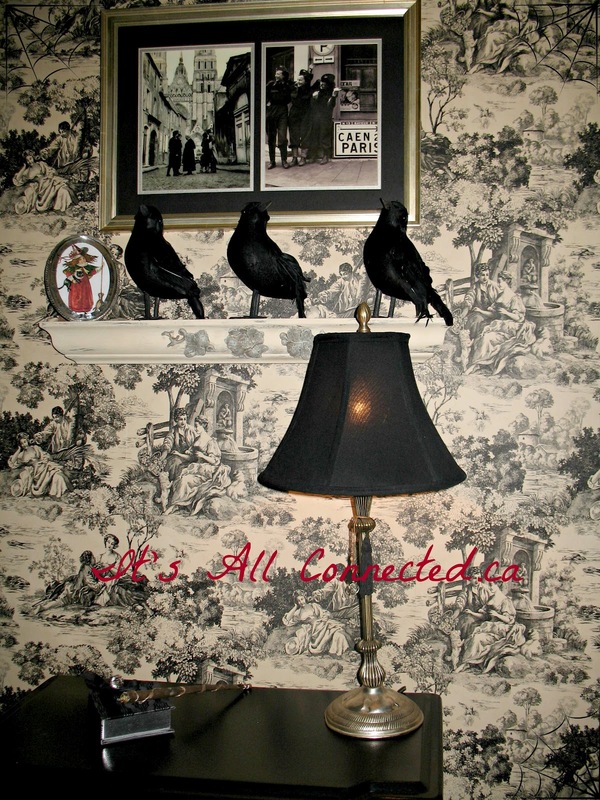 Even if you had 4 of these creepy crows, I'm a bird lover and so I am partial! I like it all but, then black is one of my favorite colors. The crows I think they look so plush. I think I may try and make some of those buckets myself looks simple enough to do. Thanks for all the inspiration. Can't see any clutter Maureen, just objet d'art (that's what I call all my stuff too). I think Jane Austen would have loved to have sat in your library to write, what lovely vignettes. I like your tip on using multiple items that are the same. The crows look great with your beautiful toile wallpaper. I love those crows....great find. I need to get myself to a Dollar store and rustle up some fall slash Halloween decoration perhaps. I am still out of doors pretending that it is summer!